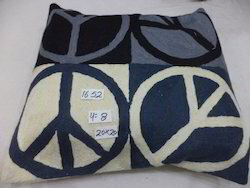 Our organization is engaged in manufacturing and exporting an enthralling collection of Cushion Covers that is available in various designs, colors and patterns. Embroidery and thread work is done on a selected premium range. Moreover, we can also customize these as per the requirement of our clients. We offer your exclusive range of hand-embroidered cushion covers from Kashmir in traditional designs, floral designs, kilim designs, modern designs and typical Kashmiri designs in rich colour combinations. 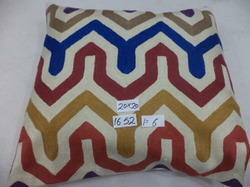 Customized designs, colours, sizes and base fabric can be done as per order of buyers. We offer you all kinds of hand-made chain stitch cushion covers in wool and silk from Kashmir in all kinds of traditional designs and colors.Always available in stock in floral,mordern,kelims designs. Other sizes can also be available as per requirement of buyer. We offer you all kinds of hand-made silk chain stitch cushion covers from Kashmir in all kinds of traditional designs and colors.Always available in stock in floral,mordern,kelims designs.tribals designs. 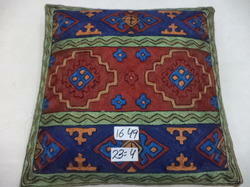 We offer you all kinds of hand-made woolen chain stitch cushion covers from Kashmir in all kinds of traditional tribal so called kelim designs in assorted colors and designs. 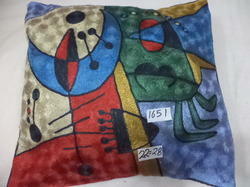 We offer you Picasso modern art hand made cushion covers from Kashmir is many designs and colors in 45x45 CMS size we also offer you same type of rugs also. 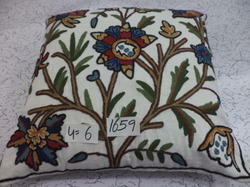 We always maintain stock of these type of cushion covers in assorted colors and designs for immediate and urgent orders. 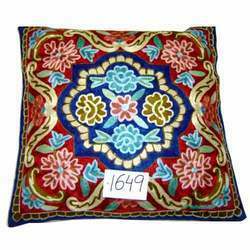 We offer you all kinds of hand-made oriental chain stitch cushion covers from Kashmir in silk and wool in many oriental,traditional,floral,tribal designs and colors. Other sizes can also be available as per requirment of buyer. 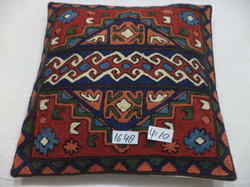 We offer you all kinds of hand-made woolen chain stitch cushion covers from Kashmir in all kinds of traditioanal designs and colors.Always available in stock in floral, mordern, kelims designs. 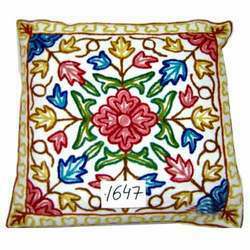 We offer you all kinds of hand-made cotton crewel cushion covers from Kashmir in all kinds of designs and patterns in assorted colors and designs. 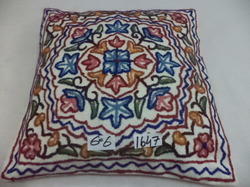 100% hand-made silk hand-embroidered(hook-embroidery) chusion covers made by best artisans of kashmir. Available size 40x40 cms and other size will be on order basis. 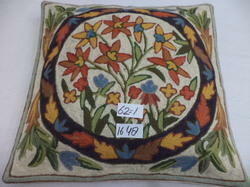 Available in all colors in floral and kilim designs. Backed by the team of skilled artisans, we are offering a wide collection of Cotton Cushion covers that is available in a variety of designs and colors. These are offered with ethnic as well contemporary designs that can go well with various styles of interior and are available at competitive prices. We are offering an enticing collection of Embroidered Cushion Covers that is available in beautiful and enchanting designs with embroidery work. 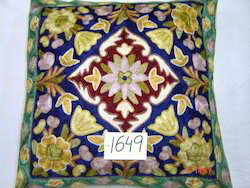 Available in varied color combinations and easy to maintain, our assortment of embroidered cushion covers are widely appreciated for their excellent craftsmanship. 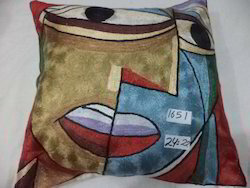 We are offering Printed Cotton Cushion Covers in a wide variety of designs, suited for different shapes and sizes of cushions. These are regarded as an integral part of every home decor. Designed with great care and flawless style, our cushion covers provide the right touch of style and elegance for diverse home decors. Our organization is engaged in offering a wide collection of Woolen Chain stitch Cushion Covers that is designed to make for a perfect match for all kinds of wall paints. Available in various designs, shapes and sizes, our range can be availed at competitive prices. 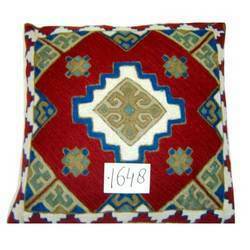 we offer your exclusive range of hand-embroidered cushion covers from Kashmir in traditional designs,floral designs,kilim designs,mordern designs and tipical kashmiri designs in rich colour combinations. 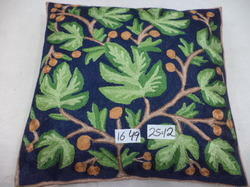 customized designs,colours,sizes and base fabric can be done as per order of buyers.